Larry’s Country Diner is one of the most popular dinner shows in Branson that offers the best performers this coming September 18 to 22. This famous dinner show comes to the Branson stage for a series of shows that you shouldn’t miss this year. As one of the biggest lineups to ever be shown in Branson, Larry’s Country Diner brings many of your favorite country music stars for a fun-filled show with great music and one of the best live entertainment shows to be seen anywhere. The host of this dinner show is no other than the famous Larry Black himself. 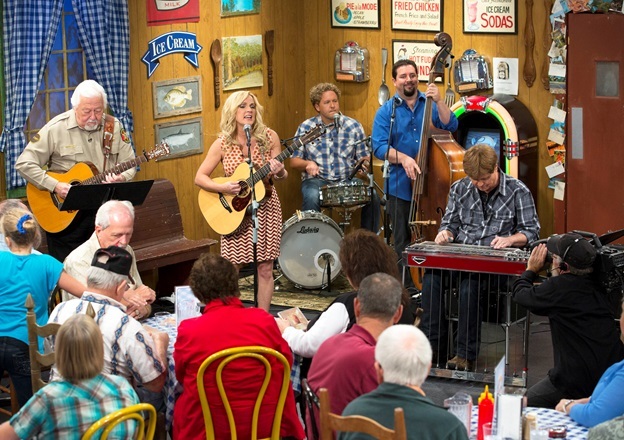 The popular “Larry’s Country Diner” brings their music to the Branson stage for an experience you won’t ever forget. Set up in the style of a popular show, Larry’s Country Diner lets you enjoy stories, comedy, and music that you have come to love as Larry shares some of his favorite guest stars in this must-see limited engagement show. This show has a similar look and format to the popular television show that airs on RFD-TV (seen by 2 million plus people each month). Larry Black and his superstar friends invite you to take part in the music, stories, comedy acts, and memories in this unique production show. Many of your favorite stars including Larry Black himself, T. Graham Brown, Rhonda Vincent, Gene Watson, Jimmy Fortune and The Isaacs, Bill Anderson, Joey & Rory and many more will take to the stage to entertain everyone in the audience. Share a wonderful time with some of your favorite country stars in a show that is unlike any other show in the world. In this dinner show, you will hear some of the best music, stories and tales by the stars of the show, and laugh along on this two-hour dinner show in Branson. This popular dinner show in Branson will showcase the talents, music, and tales of some of the most popular shows in the country (along with other styles of music as well) – bringing an array of performers’ songs to life with each show. Larry’s Country Diner in Branson provides audiences with an up-close and personal setting for some of the most fascinating performances you will ever see. Some of the stars who have taken to the Branson stage with Larry include Billy Dean, Paul Harris & Watson, Joey and Rory and many other stars. During the show, some of the audience may be part of a recording that will air on TV, and features Jimmy Capps at the guitar playing some of your favorite tunes. From time to time, some audience members may be asked to hop up and sing along with him. Larry’s Country Diner is truly a family-friendly show of unmatched proportions that every fan of country music will love. If you want to see some of your favorite country music stars in Branson, don’t miss to visit Larry’s Country Diner at the Starlite Theater on the 18th to 22nd of September this year.